The Dual Input, Dual Output Valve Controller is designed for extremely versatile control of up to two proportional outputs to directly drive coils or other loads. Its flexible circuit design gives the user a wide range of configurable input or output types. The sophisticated control algorithms allow the user to program the controller for a wide range of applications without the need for custom software. 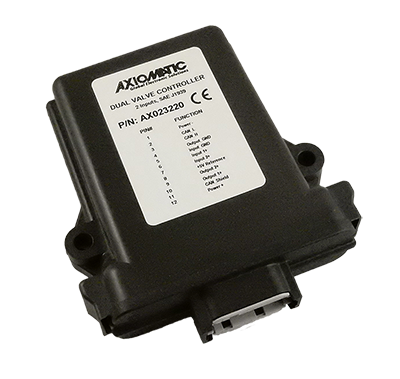 The controller has two fully configurable universal inputs that can be setup to read: voltage, current, resistive, frequency, or digital input signals. There are also two universal outputs that can be setup to drive: proportional current (up to 3A each); hotshot digital current; proportional voltage (up to supply); proportional PWM; or straight on/off digital loads. All I/O ports on the unit are independent from one another. The electronic control is a highly programmable controller, allowing the user to configure it for their application. Its sophisticated control algorithms allow for open or closed loop drive of the proportional outputs. It can be operated as either a self-contained control system, driving the outputs directly from the onboard inputs, and/or it can be integrated into a CAN J1939 network of controllers. All I/O and logical function blocks on the unit are inherently independent from one another, but can be programmed to interact in a large number of ways. It has a number of built-in protection features that can shut off the outputs in adverse conditions. They include hardware shutoffs to protect the circuits from being damaged as well as software shutdown features that can be enabled in safety critical systems. All setpoints are user configurable using the Electronic Assistant®.